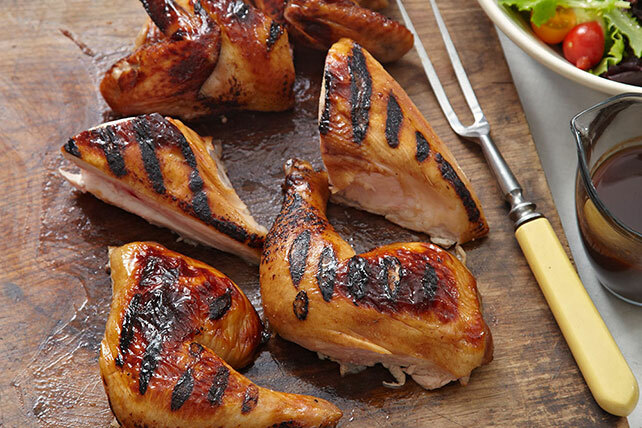 Turn chicken into a sweet, tangy dish with our Grilled Cola BBQ Chicken recipe! You only need four ingredients for this Grilled Cola BBQ Chicken. Heat grill for indirect grilling: Light one side of grill, leaving other side unlit. Close lid; heat grill to 350ºF. Meanwhile, cook cola and barbecue sauce in saucepan on medium heat 10 min., stirring occasionally. Remove from heat; stir in hot sauce. Reserve 3/4 cup sauce to serve with the grilled chicken. Cut out back bone of chicken carefully with kitchen shears or sharp knife. Place chicken, skin side up, on work surface; press firmly to flatten. Place chicken, breast side down, on grill grate over lit area; cover with lid. Grill 15 min. ; turn, then place over unlit area. Grill 25 to 30 min. or until chicken is done (165ºF), monitoring for consistent grill temperature, turning and brushing occasionally with remaining barbecue sauce mixture for the last 15 min. Serve with the reserved barbecue sauce mixture. For best results, dry chicken completely before cutting so it is not slippery. Place chicken, breast side down, on cutting board. Cut along one side of the backbone, then cut along the other side of the bone to remove it. Place chicken, skin side up, and press down firmly to flatten. For best results, grill chicken on clean grates. Let stand 15 min. before carving. When grilling over indirect heat, the food is not cooked directly over the heat source. The covered grill then acts like an oven, so there is no need to turn the food. Use this grilling method for foods that require at least 25 min. of grilling time or foods that are so delicate that direct exposure to the heat source would dry them out, such as roasts, whole chickens, thick steaks, ribs or delicate fish fillets.